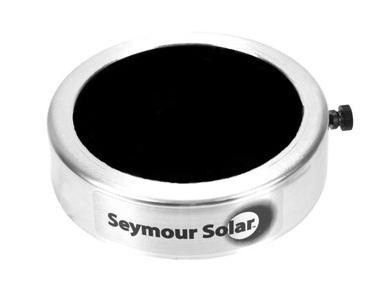 This filter features an aluminium cell with the Seymour Solar black polymer thin film. This is a great cheaper alternative to the glass ones. These films are in the same cell so they also have the nylon thumb screw for added security. This thin film provides orange/yellow views of the Sun for observing sunspots. The film blocks out 99.999% of sunlight for safe observing. The film is a black polymer thin film and is 0.002" thick. This film is a lot stronger and a lot cheaper than its competition making it the film to go for! Next day shipping on ths item!